When you’re announcing a promotion or extending a special offer, you need to make sure you’re generating immediate interest in the offer — or risk having the recipient forget about the deal or simply delete the email before reading it. In an ideal world, you will want your offers to be personalized for the recipient based on recent buying behavior or signs of interest. For example, you don’t want to send an introductory offer email to somebody who has already bought from you multiple times. You will want to send a ‘we miss you’ discount to someone who hasn’t shopped with you in the last 3 months or someone who may have purchased something a year ago and is due for a replacement or stock up. Think about different ways to segment your list so you can engage or re-engage people in your database with a personalized offer. Frame the email in a way that the recipient feels like they have exclusive access to the deal or have been asked to join a special event. 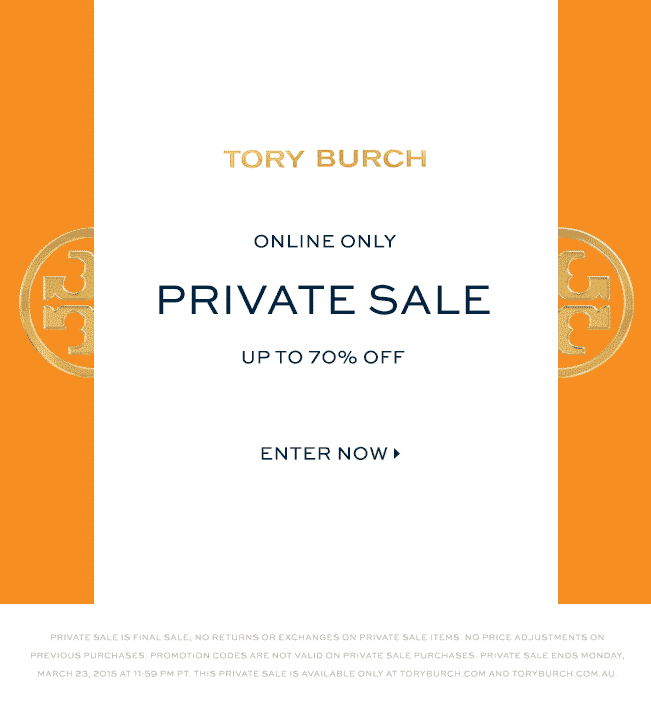 Tory Burch did a great job with this by hosting a private online-only sale. They made it easy to get the recipient’s attention by creating animated doors around the sale message, emphasizing the fact that the recipient was entering an exclusive place. Instead of announcing you are offering 10% off to upgrade an account or subscription, consider positioning the discount as a gift or opportunity to lock in an unbeatable price for being a loyal customer. Simply repositioning the offer as a gift or even a special event can encourage more people to click through to learn more. The subject line could suggest ‘gift inside’ or ‘exclusive price drop’ so that the recipient doesn’t feel pressured to buy anything — just yet. Being selected or chosen for a special offer sounds much better than receiving a notification about a current sale or promotion. It’s more personal and can encourage more people to click through to the email and then find out more about the offer. eBay did a good job with this with their holiday email campaign messaging. The subject line, “You have a special offer from eBay” leads to an email where the recipient receives $10 for checking out with PayPal. 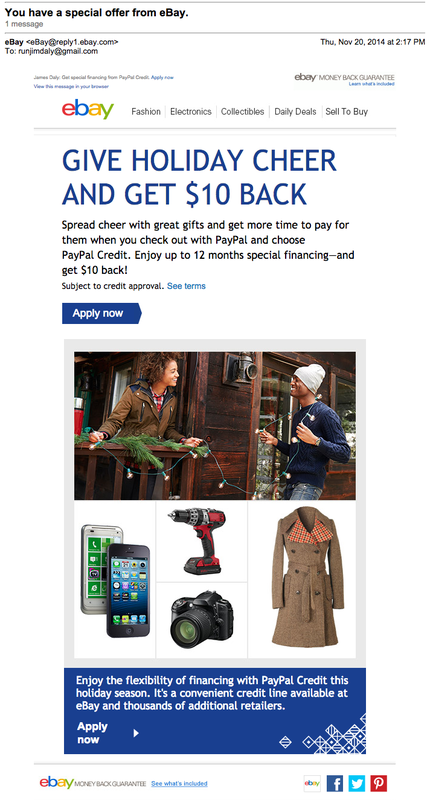 It’s an incentive built in to an offer for PayPal credit financing — and an effective one at that. Not only will a ’50% off sale’ announcement sound spammy, but it can also leave you with a log of unsubscribes and instant deletes when the recipient is not interested in shopping at the moment or didn’t sign up for promotional emails. One way to get around this challenge is to position the email as an event happening at your store or company. Your subject line might be, “Our biggest sale event starts tomorrow…” and then go into details about discounts available in the body of the email. Target did this with their holiday sale a few years ago, providing a tip for saving money for the one in the subject line and then announcing discounts in the body and graphic of the email. This way, the email reads more like a newsworthy email instead of another promotional message. Making sure your offer emails get opened and clicked can be tricky since there’s always a risk that any type of ‘salesy’ email will end up in the junk folder or be flagged as spam. However, there are several ways to encourage recipients to engage with the email and prevent an unsubscribe. Positioning the email as an event or news item could be just what it takes to boost those open rates and drive more traffic to your offer landing page.